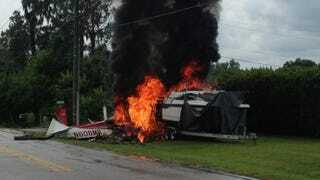 A brand-spanking-new Mooney seems to have gotten in a fight with a boat in Central Florida. It’s not exactly clear who won, although the irony may have been lost on the pilot, who walked away from the crash and began filming the ensuing inferno. Aircraft registration information shows the Mooney M20TN was built earlier this year and is registered with the manufacturer, so there’s a good chance it was either just purchased or still owned by the dealer. Lakeland Fire Department crews responded to the plane crash at Pipkin Creek and Village Road in Polk County, just short of runway 27 at the airport.